Thoughts on stories, the universe, and everything. I happened to see Star Wars, The Last Jedi yesterday in a very clean and inexpensive theater in Monterrey, Mexico (just here for a short time this trip). Watching a moving in the United States increasingly seems like a waste of money, but I digress from my point...which is commentary on the movie itself. While I am going to commit some SPOILERS they will be of a general nature. I am not going to reveal how the story ends or some of the key bits of information the tale gives out. I do share some story details, but deliberately out of context. And while this is also a general review, I am going to focus on one aspect of the story that caught my attention that may not be the first thing most people think of with this movie. The Last Jedi addressed these concerns of mine pretty well, as if the producers had listened to some of their critics (I was far from the only person to be concerned about the things I just mentioned). While the story has some elements that resonate with familiarity to what happened in Empire Strikes Back, this movie is far, far, different from that tale. Kylo Ren got stronger by the end but paid some consequences for screwing up prior to that. Rey was still super powerful for someone completely untrained, but in some ways showed some more limitations and vulnerabilities, which I thought was good for her character development. Though, yes, the story still makes no sense at times, but improved in that department when compared to The Force Awakens. Though you do see some things that make no sense. Like bombers being used in orbit...um, think about that for a minute...why is a bomber not going to work in space?...er...yeah. Or how could they be so sure that only one ship was tracking them? How would they know? And how would they know the ONLY way to get filthy rich is to sell weapons? Er, since when? And some other things. But for once a harebrained attack idea actually totally failed and the replacement plan nearly totally failed as well. Which is more realistic than Star Wars has been before. So I saw that as improvement. I would say as a negative criticism that this story did not have the strong emotional resonance with me that The Empire Strikes Back did. But it had some high moments, including especially Luke Skywalker finally doing something to help the other characters in their dire situation. Overall, it proved to be an entertaining movie. A pretty good story. Not really great in my book, but definitely worth seeing. One thing that struck me about the story though is that on both the First Order side and among the Resistance, the younger, more impulsive types were continually rebelling against their older superiors. As in not following orders. Or even more so, actively overthrowing those in power. And that mostly worked for the younger characters. I mean, they faced few consequences of their actions. Generally, they wound up in greater positions of trust AFTER resisting authority than they had been beforehand. Poe disobeying General Organa went the worst...as did his later actions against the female commander who replaced her temporarily. But still, in the end, he is seen as a leader and is followed. Everyone respects him. He does not really feel much guilt about his actions and suffers no serious consequences. Rey does not really need Luke (though Luke does not prove to be totally useless in the story). Kylo resists Snoke. Fin battles Captain Phasma, his former commander. Pretty much in every case it all works out for the good for these characters. Rebellion is rewarded, even though the BIG rebellion, the Resistance itself, does not do very well in the confines of this movie. It might seem I am nit-picking here, but consider how different this was to what happened in Empire Strikes Back. Luke Skywalker, though likable, was in fact a bit of an ignoramus who needed some stern discipline on the part of Yoda in order to even begin to straighten out. The master knew more than the pupil, as was also true when Luke learned from Obi Wan. When Luke rushed off early to face Darth Vader, fans seeing the conflict for the first time could hope Luke could pull off a victory, but he in fact failed rather miserably, losing his hand, NOT saving his friends, only spared by Vader due to a terrible truth he was unprepared to face. The elders really did know something he did not--Yoda really was the master and Luke the student. With Rey and Luke Skywalker--without giving away anything specific--let me say that is not the relationship at all. While he does know a few more things than her, he is mired in his own point of view, one shown to be in effect "just Luke" and not reflecting any special wisdom. While Luke and Leia do know a few things that the younger generation does not, they are not especially wise. Resisting their advice does not come with especially sharp consequences. 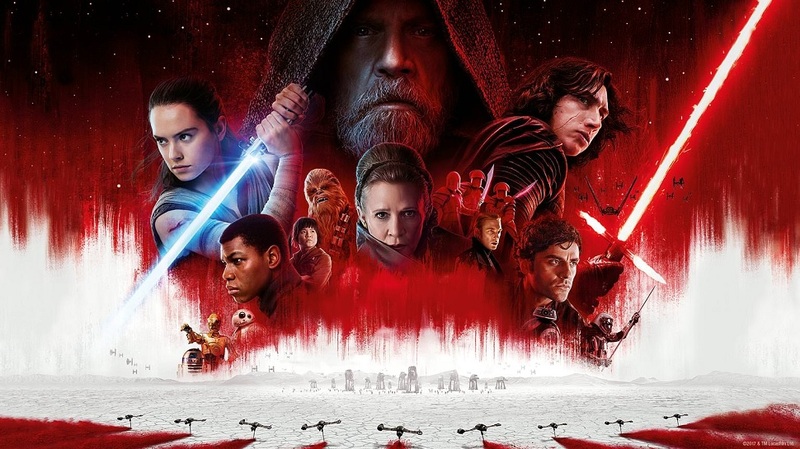 In the end of The Last Jedi, the collected wisdom of the Jedi proves to be disposable--the story could and did do away with it and no negative consequences came about as a result. Perhaps I can be accused of looking for negative issues, searching for bones to pick. I probably am, though by force of habit rather than deliberate choice. While the clearly deliberate efforts to replace male authority with female in the overall arc of the new tales and to establish greater racial balance than past stories could perhaps be criticized as bowing to modern opinion first and caring about storytelling second, such things only mildly caught my attention in The Last Jedi. The storytelling actually was pretty good and essentially believable, Social Justice Warrior influence (however much it may have been) notwithstanding. But why was it that this new movie consistently showed older people and past tradition in a negative light, something do be defied, or worked around, a rebellion upon the rebellion portrayed against the First Order? I don't know. But it bothered me a bit. Last week I traveled to the Guadalajara Book Fair, one of the largest book fairs in the world and the largest in Latin America from what I've heard. I attended a number of events and looked around the entire grounds, but only in Guadalajara for four out of nine days of the fair. 1. Are any Christian publishers already selling speculative fiction in Latin America? 2. Is any speculative fiction being sold at all at the fair? And if so, by which authors? Published by whom? 3. Factor X. What might I learn at the fair that I don't even know could be possible? Probably I spent the most time on point number 2. I don't know how many books were on sale at the fair, but the number was massive. I did not see every book, but I did go to every store and look around for science fiction and fantasy and/or horror, a.k.a. "speculative fiction." Since I hoped to find a Latin American publisher for translations of stories I have either written or edited, I thought it would be great to see if any publishers in the Latin American world were already producing speculative fiction. By the way, the things most in view by the US publishers were works of fiction tied to American movies or TV series. Some American comic book translations were around (both Marvel and DC), Game of Thrones (and other G.R.R Martin books), Harry Potter, Lord of the Rings, and Star Wars. Some Divergent and Hunger Games, too. In horror books, almost exclusively Stephen King. I finally found a genuinely Mexican-owned establishment which carried a significant amount of speculative fiction. All was under the title of "ciencia ficcion" by the way, marking that term as their roll-up catch-all for speculative fiction, which surprised me. They had, like others, G.R.R Martin, but not much else fantasy. But they did have some classic science fiction, some not carried at the book fair by the American publishers (as far as I saw)--Arthur C. Clark and Ray Bradbury among them. They had Stephen King like the US publishers, but also Anne Rice. A LOT of Anne Rice. But no Harry Potter that I saw and no Star Wars. So I drew a conclusion from what I saw that it may be the case that this Mexican establishment carries science fiction to compete with US-owned publishers but carries authors for whom exclusive contracts do not exist. Maybe that's true and maybe it isn't, but if it is true that this company is searching for lesser-known books to compete with the "big boys," it may represent an opportunity. Maybe they would be willing to give books a try that other bookstores would not. Oh, by the way, the Mexican company I'm taking about is not primarily a publisher, though I think they do publish some books. It's a bookstore chain, one called "Ediciones B." I plan to contact them in the near future, but I may have to do so as a publisher in order to have books distributed rather than as an author/editor. Circling around to my point 1, I saw very few Christian publishers at the book fair at all. Tyndale was there selling Bibles, as were the "Sociedades Unidas Biblicas." But there were no other Evangelical publishers there at all, even though Mexico has some (I found out at least one was hit hard in the earthquake not that long ago south of Mexico City, and that's why they were not there). I did see some Catholic publishers, but they hardly carried any fiction at all. Some for kids and some classics, but they mostly had non-fiction. 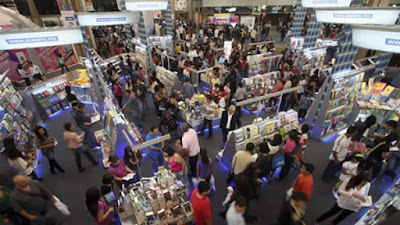 By the way, I don't know what the proportion of fiction to non-fiction would be at a book fair in the United States, Canada, or Europe, but non-fiction was HUGE at the Guadalajara Fair. Clearly a lot more non-fiction sells in Latin America than fiction. A lot was religious, not just the Catholic versions, but I also saw plenty of New Age books, plenty of tarot and mysticism and that kind of thing. (And in the category of fiction that makes non-fiction claims, I also saw plenty of Dan Brown books.) The dominance of non-fiction was a bit surprising for me, but what I saw may mean I should write more non-fiction--IF reaching the Latin American market really matters to me (which I would say it does). The biggest surprise was I found some governments and non-government organizations are actively seeking to promote the national literature of their countries and as a result are willing to pay for translations to and from various languages. The Sharjah Book Fair of the United Arab Emirates is especially interested in translating books to and from Arabic, something I would like to apply for concerning my books. And New Zealand is looking to fund translations of NZ books into Spanish--so I am going to see if, God willing, I can arrange the translation of some books from my friend Grace Bridges at Splashdown Books in New Zealand into Spanish or possibly Portuguese, with New Zealand footing the bill. And Argentina is funding translations of Argentine authors into English, a task which I'm capable of performing myself and would not mind getting paid to do, assuming I can find some Argentine speculative fiction I would like to publish. So overall, the experience at the Guadalajara Book Fair was a good one. I learned some important things and found a few new opportunities I'd never thought of. I'm coming to the end of what proved to be a month-long ordeal, JRTC (Joint Readiness Training Center), at Fort Polk, Louisiana. I am here with my Army Reserve unit, naturally, where we spent a week on orders prior to going to Louisiana, a week preparing to go to our field training in Louisiana, and then two weeks “in the box,” i.e. in the midst of our particular war scenario. I'd like to write a post about the war scenario itself, but a particular incident that happened coming out of the field yesterday gave me something to write about first. Military dining isn’t usually bad. The modern Army usually has contractors provide meals, unlike the infamously bad Army cooks of the Vietnam War and earlier. And it happens to be true the contractors feed us very well, almost always. But in the week of getting ready to go to the field in Louisiana, we had eaten hot food provided by one of the supporting units for our JRTC exercise, the 52nd Brigade Support Battalion. For once, we actually were eating food provided by military cooks. While better than eating, say, wood chips and grass, it wasn’t what a well-fed American Soldier call “good eating.” Plus, the dining area was horribly mismanaged, with thousands of troops trying to pile into the same single fabric-topped building at the same time. The building was large; it sat hundreds, but the demand was in the thousands, so lines were long; sometimes food ran out before everyone ate and often it wound up being cold. So, my expectations were low when going to eat at the dining facility at FOB Warrior yesterday. In a building with a fabric top. But to my surprise, contractors were serving the food. And the meal was steak and shrimp. With fresh salad and fruit. With cheesecake for dessert (chilled cheesecake). I returned to the barracks we’d been put in with the good news of how surprisingly good the food was. And I immediately met with skepticism from two soldiers I personally know to be very intelligent, who both reasoned with me that what I was saying could not be true. This struck me after the fact as a moment worth of drawing an analogy. 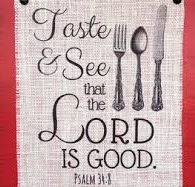 “Taste and see that the Lord is good,” begins Psalm 34:8, implying the God can be known by those who want to find Him. Those who seek out and test the truth about God can find not only that He is real, but furthermore, that God is good. It would have taken the two members of my unit a mere five minutes to walk down the road to find out if what I was saying about the meal was true or not. But they would not do it. 1. Some people are naturally disinclined to believe a witness talking about something that “seems too good to be true.” Such people in fact often feel no particular need to investigate whether or not this something is true; if it makes no sense to them, it is not true, period. Note I am not maintaining that there was no way to give them more evidence. I could have in the case of the meal, definitely. However, they had sufficient evidence from me to investigate for themselves, but they simply wouldn’t do it. It was more believable to them that I, a person who tries very hard to be honest at all times, was deliberately lying (for the purpose of a joke), than to believe good food was just a short walk down the road. How much more are some people unwilling to contemplate that God might be real and might in fact care about the human race? To them, that’s nonsense and they simply won’t believe anyone who tells them otherwise. 4. Explanations of witnessed events are not required to believe them and it’s unreasonable to expect otherwise. Yes, it’s possible for people to delude themselves. Yes, it could be I imagined the meal I ate, though for me that would be more unlikely than me eating it, since I don’t regularly have delusions of eating imaginary food, no matter what the skeptics thought about the situation (though in fairness, they maintained I was lying, not that I was delusional). Yes, it could be I have imagined God’s presence in my life, but other than God, I do not in fact routinely sense people who are not around. I have every reason in fact to believe what my experience tells me, even if I cannot fully explain it. And that’s normal. Not irrational, not weird. Simply how experience ordinarily works. Doing something boring for the Army (waiting for Reserve Soldiers to check into a building), I happened to find out something really interesting via reading an old magazine lying around, something worthy of a blog post. A scientific study conducted interviews with WWII veterans--the group including veterans who had been highly decorated for valor. The purpose was specifically to determine what the relationship was between leadership traits and heroism, with the presumption that the WWII survey results would be broadly applicable to heroes in all wars (which makes sense, but may not actually be true). The study did find, as I imagined the people who created it expected, that veterans who described themselves as “strong leaders” were more likely to have received a reward for valor than those who did not describe themselves that way. That particular factoid didn’t really interest me. What did catch my eye is the fact the study found there were two different personality types that won awards for valor. One type they described as the “eager enlistee.” The eager enlistee had tremendous enthusiasm for joining the war and taking part in combat. The number one personality trait that identified “eager enlistee” heroes is that they were natural risk-takers. They described themselves as having a past record of taking risks that other people do not normally take prior to ever being in combat. Another type they described as the “reluctant enlistee.” Reluctant enlistees had no particular enthusiasm for war but joined the military because they were drafted (other situations like joining out of financial hardship may also have applied). The number one personality trait that identified “reluctant enlistees” who had performed acts of great heroism was selflessness. Reluctant heroes described themselves as having a trait that would give them a track record of putting the needs of others first and caring more about other people prior to entering into combat (and who would seem to have performed acts of heroism to save the lives of those they served with). While both eager enlistees and reluctant enlistees were better leaders than average according to this study, isn’t it interesting that people demonstrated to have performed heroics fell into two distinct types? The eager to fight risk-takers and the deeply loyal self-sacrificers? Alara's Call is a fantasy novel whose cover I've included at the top of this post. I must say that I didn't think when I first saw this cover that it was the best one possible, because to my eye it does not suggest the story is set in a fantasy world. It appears, rather, to be a cover of some form of historical romance. By saying the story resonates with the historical past, I mean a lot of story elements have a very familiar ring to them. You will hear characters talk of trade agreements; there's a mention of a clearly Trinitarian religion with some kind of church structure; you will find written scriptures, familiar prayers, professors of theology, recognizable kings (but not where Alara comes from), kingdoms, republics, and diplomats--and even far more mundane items like coffee and tea. Hundreds (if not thousands) of correspondences with the world we live in. I only named a few. In addition, Alara's Call does not feature any fantasy races like elves, dwarves, or trolls. In the story, Alara has visions that come from the Deity, but the tale does not feature story magic. A fair amount of physical combat occurs in the tale, but the most common weapon is the very familiar sword from the past of our world, followed by the use of bows and arrows. Nothing strangely fantastical is described in terms of technology. There's also no mention of historical items like gunpowder or combat rockets or anything obviously beyond the Medieval in terms of weapons of war. But subtle indications of medicine developed far beyond the Middle Ages do exist--the story does not indicate, for example, that women dying during childbirth is common, or that children passing away at a young age is a normal thing throughout this world. The fact that women are not dying off of childbirth and are not chained to producing a large number of offspring just to ensure some of them survive (which has been a characteristic of certain periods of history--less of the Middle Ages than is commonly believed, but still a feature of those times to a degree), means that whether a society treats its women as full equals or not is simply a matter of choice. The bad guys, naturally, oppress and isolate women. While the good guys do not. Alara's own father comes off as a heel, making a trade deal that involves Alara being sent to a hostile woman-oppressing kingdom for reasons that have differing implications for each of the major parties involved. Her response to this situation is the primary source of conflict in the story, followed by her love interest in the man who supports her during this difficult time and follows her on her journey. Though it's noteworthy that the hostile foreign kingdom does not believe in Alara's faith either and are oppressive of her religion. However, since the Trinitarian faith in Alara's Call takes a decidedly fantasy twist in that the savior in this alternate Earth was a woman, the oppression of women and the suppression of Alara's faith are not disconnected issues. But it is not true that men as a whole group are bashed in this story--not at all. Numerous men, not just Alara's love interest, are shown to be decent and helpful and good, though it is true the baddies are essentially male. I find the most interesting speculative element in the story that of a Trinity more canted towards the female. Perhaps a society like that would have had a different Garden of Eden and a different fall and a different curse than our world had, giving the separation of genders an entirely different framework than we have in our reality. Likewise, if the savior had been a woman, it would be only natural to expect more women ministers than men, as is the case in this novel (Alara herself is a cleric in the story). Names of places and people (and basic geography) are also unlike those of our world, giving this novel a fantasy feel. But so many things are ordinary that in some ways this story does feel historical--almost like Zorro or some other story with a great deal of swordplay from the historical past. The use of familiar situations and objects allowed Kristin to give this story a great deal of very rich description that's easy to grasp, from objects of ordinary life like fabrics, metals, books, and many other things, to complex political and social situations. This world is rich, warm, and friendly in its familiarity, but it is not really Medieval or a match to any period in Earth's history. The subtly but fundamentally different nature of religion above all else really does make this story a true fantasy, a world essentially unlike the world we inhabit, even if familiar. It's an interesting twist of a story world, with a likable protagonist. Who is in fact interested in the literal liberation of oppressed women. A story world I found interesting and a tale which many of you who view this post would enjoy reading. "Tales are often told of heroes who fulfill ancient prophecies. 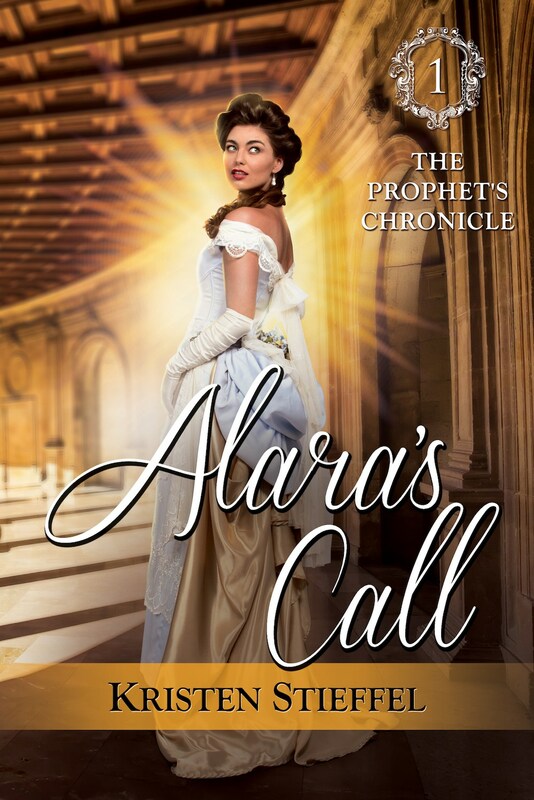 Alara’s Call is the tale of a woman who gives new ones. minister, jeopardizes her dream and her safety when he coerces her into what he calls a diplomatic mission. The story will be released September 19, Paperback: $16.99, eBook: $4.99 (Pre-order Price of $2.99) via Love2ReadLove2Write Publishing, LLC. 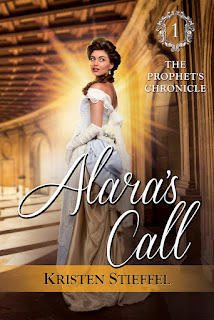 Genre: Inspirational Fantasy, 430 pages, ISBN: 978-1-943788-19-4, Full title: Alara’s Call: The Prophet’s Chronicle, Book One by Kristen Stieffel. The cartoon I included to start off this post comes from "The Universes of Max Tegmark" and has the purpose here of illustrating the "Many Worlds Interpretation" of quantum mechanics, or MWI. It shows that because of a single decision, in one universe a couple is married with two stick-figure kids, while on the other they live on opposite sides of the globe. In short, like the cartoon, MWI says some of the weird things found in quantum mechanics like an electron interfering with itself (apparently by being in multiple different places at the same time) happen because there are multiple worlds, multiple universes, laid on top of one another accounting for an electron or other quantum appearing to be in multiple places at once. Once something happens that forces a decision (like a measurement), then all the possibilities remain true--but do so by universes splitting off in different directions. In MWI, which I don't in fact hold to (where does the energy come from to make the new worlds? ), every single decision at the human level creates a new universe. But far below the human level, every single quantum makes a new universe any time it is forced to be in just one place, which may happen billions of times or more within a single second in our vast universe (or multiverse). By this view, the number of universes is not only mind-mindbogglingly huge, it's increasing continually at an immense rate. Because for every possible decision or split, ALL become true in some new universe out there somewhere, each new universe in turn generating a whole spew of new universes continually. But what if a MWI hypothesis functioned differently? What if in some space we can't observe by ordinary means, the two universes based on the decision made by the couple in the cartoon above--the one in which they marry and the one in which they don't--already existed even before they met one another? This would allow multiple universes to be centered on one another to account for the weird interference patterns in quantum mechanics just as well as standard MWI would do. But instead of splitting off, each time a decision was made one or more of the potential universes disappeared, like soap bubbles popped by a needle. So the number of universes would drop continually, becoming less and less, fewer and fewer. Finally, at the end of time (whatever "end of time" means), there would be just ONE universe left. By the way, friends of mine who read my Facebook page will notice I said several months ago that I think about quantum mechanics on a regular basis and my mind tries to solve the strange explanations it engenders--even though I don't at all have the proper mathematical or scientific background to do this kind of work. I also mentioned I'd thought of a "solution" to quantum mechanics without saying what it was--yes, this is one possibility I was thinking about (I've thought about two, but the second isn't ready to talk about yet). Instead of just holding onto my idea (I have no reasonable means to write a scientific or technical paper about my notion), I'm floating it as a backdrop for science fiction stories. 1. Reducing Many Worlds Interpretation (we'll call this "RMWI") would parallel thermodynamics. In fact, the universe starting at a high state of thermodynamic order and going downhill towards entropy would match very well a universe beginning with an enormously huge but finite number of possible outcomes existing in some overlapping system. Just as the Second Law of Thermodynamics would pull the universe into a greater and greater state of disorder (entropy) as time went on, so would the number of possible choices and also possible universes would become fewer and fewer. At total entropy, of course no more choices would be possible--there would be only one universe left. 2. RMWI would embrace the "arrow of time," which many physicists wonder about. The past would be definitely different from the future and our motion towards the future would reflect potentialities being closed off, fewer and fewer sum total options in the multiverse as a whole as time advances. 3. RMWI would explain where all the other universes came from better than MWI--they originated in the beginning, in whatever process developed the universe or multiverse to start out. Losing them as time goes on seems less of a violation of the Conservation of Matter and Energy laws than gaining new universes as time goes by. 4. RMWI would parallel the "blockworld" model without being strictly deterministic. The blockworld--or better said, "The Relational Blockworld Interpretation of Non-relativistic Quantum Mechanics" (RBW) is an idea floated by physicists in recent times that holds all points and all events in the universe, past, present, and future, all exist somewhere in the space time continuum right now--because time is seen as just another dimension, like space, as per Relativity. This view winds up saying the entire universe is in effect already planned, every action flowing invariably from previous actions, already existing in space-time. RMWI would agree the universe was already planned and we cannot go outside of any parameter not already at the existence of the universe (or multiverse) at the beginning. However, all choices, from quantum to human "choices," really would matter because each one would alter the nature of the multiverse, driving it one step closer to it eventually existing as a true universe--when only one possibility remained. 5. RBWI would imply but not prove the existence of God. If the universe really started with every possible option existing right from the beginning, wouldn't that imply an all-knowing Creator who put such order into universe from the beginning? Yes--but the universe beginning at a high degree of order (that is, very low entropy) already implies that and some scientists seem to have no trouble thinking of the low entropy at the beginning of the universe as strictly natural. No doubt they could come up with a naturalistic explanation for a multiverse of all possible choices at the beginning of time as well. 6. RBWI would parallel some aspects of human life. We could imagine a human baby having a vast array of possible selves superimposed on that one child. As the child grows older, some of those possible choices go away (such as dying as an infant somehow). As the person gets to be an adult, he or she experiences a great deal of options--but as each choice is made, all the other possible choices we can imagine could have happened evaporate. As a person gets older, the number of choices become fewer and fewer. You won't be living that dream to go to medical school at age seventy--that choice has evaporated. Finally, all possible choices come to an end as the human being passes from Earth via bodily death (or so it would seem). So, how would this affect science fiction story ideas? 1. There would be parallel universes, but not as many. Since the MWI has the number of universes increasing indefinitely, as far as we know for all eternity forward, it allows for all kinds of alternate realities. RMWI would be somewhat more tame, especially in the future. But note that imagining RMWI were true would still allow stories where a person could cross from one parallel universe into another, just like MWI. 2. The past would have more universe possibilities than the present or future. In fact, it might be fun to imagine gong in past would automatically put someone in a potential past that could have been different from the one that led to our present--but at the same time going forward in time from there would still only lead you back to the time you started from. That may not entirely make sense, but it could be an interesting plot device. Also it would be interesting to have characters enter a story believing in MWI, but as they travel backwards and forwards in time, they discover that what they believed to be true was wrong--the future has fewer possible choices, not more. 3. Stories could still make changing the past either possible or impossible, as already happens in science fiction, but all changes would be from a "menu" of pre-existing possibilities. No one would be able to change the future into a version that hadn't already been allowed for in the past. The number of possibilities could be immense, but would be finite. And would be fewer in the future than the past. 4. Whether or not changing the past is possible, the universe would be both deterministic and allow for free will. The universe would come to a certain, natural end (total entropy), barring Divine Intervention (but a universe coming to an end via Divine Intervention would also come to a single certain end). But many free choices, as in eliminating things that are not going to happen, would take place along the way to the end. Other story implications of this explanation for quantum mechanics my brain cooked up probably exist. What would you say about how this idea like this could be used in a story? I remember as a kid watching the Black Sheep Squadron television series, about Marine Corps fighter pilots in World War II somewhere in the South Pacific. While I saw other shows set in war like MASH and Hogan’s Heroes, Black Sheep Squadron was the first series I watched that featured combat prominently (mostly from stock footage of airplanes zooming and sounds of machine gun fire). By the way, let me apologize for the length of this post up front—it’s not a quick read, which I don’t say to scare anyone away. But be aware. I’d had other ideas about fighting before that, largely from Disney movies like Sleeping Beauty, in which Prince Phillip battles Maleficent-turned-dragon. That scene made a deep impression on me and as a kid I often imagined myself as the dragon-slaying knight, the warrior for goodness and truth. But with Black Sheep Squadron, I imagined myself a fighter pilot, the personality of the knight riding in an aircraft cockpit. I also saw some classic WWII movies on TV, like The Dirty Dozen. I saw war and being a warrior as glorious. Who wouldn’t want to fight bad guys in a war? 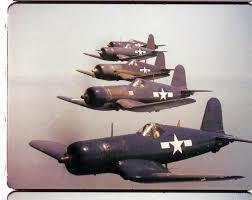 I drew pictures of aircraft and naval battles in that period, lousy drawings really, but full of energy and excitement. My mother praised my efforts as kind mothers do, so I decided to send one of my drawings of a carrier battle between US and Japanese ships to my grandmother, expecting her to be as pleased as my mother was. Or even more pleased, because she had been a nurse during WWII and would appreciate my theme. She wrote me back based on the picture I sent, telling me that war is horrible, that as a nurse she only one time witnessed an explosion tearing up the bodies of men, but once was all she needed. More than enough to know what war is like. Please stop drawing her pictures like that. I was genuinely shocked. What? War is not glorious? But the impression that letter made was short-lived. Another note of discord came when I saw the movie A Bridge Too Far as a kid with my family (at a drive-in theater no less), based on a real operation in WWII, which featured defiant British troops isolated from help due to their parachute drop, with American troops fighting hard to come to their rescue. I thought I knew how that was going to turn out: YAY USA…but what the heck, the Brits wound up starving and out of ammo, many killed, forcing them to surrender? The US forces never able to link up with them? And Polish paratroopers getting shot while they were still in the air when they came down to help? I had no idea how to judge that and compare it to things like Black Sheep Squadron. For me, it formed a puzzle in my mind—what is war really like anyway? Is it pure horror? Or glorious? In my teen years I was required to read The Red Badge of Courage at school, which was followed by commentary from a teacher who never had been to war, talking about the horrors of the Civil War. Like he would know, I thought. I also met some real veterans during that time, men who fought in Vietnam. Mostly, the Vietnam guys did not talk to me much about their experiences, though one did tell me that a moral man can only fight a war if it is to remove an evil greater than the war itself, like Hitler. Whereas a moral man will suffer intensely in a war that removed no evil. I listened and noted what I heard, but did not really understand. As a teenager I had a poster on my wall of fighter aircraft of the world and loved to read books about military gear and strategy. I even invented my own Role Playing Game I called The Elite which was about mercenaries and which mostly fixated on weapons and weapons damage. I often talked about joining the military and becoming a fighter pilot on my way to becoming an astronaut—which wasn’t a realistic ambition for me (I needed glasses but didn’t know it, among other issues) but it was in fact what I wanted out of life. By the time I actually joined the Army Reserve, I was 21, married already and had become much more aware that the New Testament clearly commands “to turn the other cheek.” I’d laid aside my former dreams and hoped to be a foreign missionary or teacher. I joined the Army for the college money. I became a medical specialist because I hoped I would not actually have to violate the New Testament commandment not to kill, even though I was not really sure I knew what that meant. Less than a year after I completed my training, Operation Desert Storm kicked off. I was activated and served in a hospital unit that deployed to the United Arab Emirates. We worked in a civilian hospital, but my unit lived on a patch of desert beside the hospital, at first in tents but later in trailers, which we had to defend with sandbag walls and guard towers, because the UAE never expelled the Iraqis who lived in their country and our threat of a terrorist attack was high. Doctors and nurses did not carry the weapons to defend the place—that fell on more junior Soldiers like me. Though nothing happened, my take away from that experience is that war is not something light-hearted. It’s a serious business and I had committed myself to it if I should be needed, even though that’s not what I had understood myself to do when I enlisted. Between 1991 and 2008, my next war, many things changed. Driven by my curiosity about the true nature of warfare, I’d read a lot more about it. I’d watched more war movies. I came to believe that “turning the other cheek” is not a command to non-violence, but a command to repudiate personal vengeance, which is not the same thing (that’s how I still read that commandment by the way). I had become an Army Reserve officer, in a unit that specialized in military training. I myself held a combat arms specialty—Field Artillery. The pendulum had definitely swung back in the direction of me seeing war as glorious, albeit with caveats that it could be awfully gruesome. I went to Iraq as a “training support specialist” but wound up advising Iraqis and worked full-time with combat arms specialists in the armies and navies and air forces of many nations who were involved in Iraq, especially the British. I worked with a number of combat veterans and professional military with far more training in combat than I ever had. I knew a quite a lot about war at this point. But a rocket attack that killed two people and wounded seventeen, in which my best friend was among the wounded and a good friend was killed, drove home the difference between knowing about war, and knowing war. Like a person imagining what a dish might taste like based on its ingredients, I could imagine what it would be like to lose a friend in a war. But tasting the dish is an altogether different experience. I did not see my dead friend that day, even though I helped with the wounded, because I helped with those already outside the gym whose roof had been penetrated by the rocket that exploded inside. I’m thankful for that, that I never saw Major Stuart Adam Wolfer dead. Though at the time, I felt guilt once I knew he died, as if I would have been somehow magically been able to make a difference if I’d been at his side. Of course, you could say a rocket attack is not really combat. It’s a wartime event, like the London Blitz or something, but it isn’t facing off with an enemy and shooting. I was still in fact curious about what it would be like to do that. In 2010-11, I served in Afghanistan, in a unit commanded by a Navy Seal and where I met and worked with Green Berets and Marine Special Forces and I also met some other elite troops (including French Foreign Legion a year later in Africa). By worked with I mostly mean I did planning with and helped them succeed by providing money for projects, because I was a Civil Affairs officer by then--not that I was a special operator myself. But I had dozens of conversations with people who had combat experience. I had a good sense of what they did. They were open to me in a way the Vietnam Vets I knew had not been—I think it’s because I wore the same uniform as them and took a small portion of the same risks. But it was not until I served as a liaison officer to the Italian headquarters at Camp Arenas in Herat that I got the final piece of the picture of what war is like, the thing that made my curiosity about the true nature of war go away, convinced that while my nibble on the flavor of war had been a small one, it was enough. More than enough to know what war is really like. I got the chance to visit an Italian compound in downtown Herat, Afghanistan, one dedicated to their version of Civil Affairs, in other words, a place inhabited by people who worked humanitarian projects in Afghanistan for the purpose of “targeting” or persuading key people to support NATO and ISAF (International Security Assistance Force) operations there. While there I enjoyed an authentic Italian pizza cooked in an oven for which the wood had been flown all the way from Italy (I’m not kidding—Italians take their cuisine seriously). I talked to people. I looked around the buildings. I waived at the serious Afghan guards hired on contract to protect the place. I noticed that the compound had a number of higher buildings around it, which I didn’t think about very much. Six days later, while doing my part of the command briefing that constituted my main job as a liaison (it’s a side note, but I also helped write strategic plans for the Italians because it was easier for me to write in English than it was for them—and all NATO plans have to be in English), I heard about an attack on the compound I’d visited, in detailed briefing. Insurgents had driven a car bomb to the gate and blew it up, killing a number of the Afghan contract guards I’d waved at. But then the insurgents expected to be able to storm the compound but couldn’t, since the rubble from a collapsed guardhouse blocked the hole they’d made in the gate. They also had taken over the surrounding tall buildings and shooters begin firing down into the compound. They grievously wounded an Italian captain I’d shared pizza with. A United States Air Force finance officer, one Captain Brasheer if I remember the spelling of his name right, climbed into the rubble and used the M16 he’d been issued to return fire. Not that he’d every spent much time with an M16, not that he had much chance to hit the enemy, but he did what he could. While under fire, US medics answered a MEDEVAC request and landed a helicopter, and at risk to their own lives rescued the Italian captain and some other people. Outside the compound, the Afghan Army, once they were able to respond a few hours later, aided by US advisors, did what they were supposed to do—they charged up the stairs of the tall buildings around the compound and took out the attackers. But at least two attackers were wearing a suicide vest, which they detonated, killing a number of Afghan troops. I knew this place as I heard the events reported, the exact layout. I knew the people involved. You could dismiss what the insurgents did as an act of terrorism, but it wasn’t. They attacked a military compound, even if one that acted as a center of humanitarian assistance. They killed armed people and their attack showed military planning and tactical savvy, even though it largely failed (and as a result was never reported in the USA). What they did was an act of war, even though the only people they killed were other Afghans. And so I realized with full emotional flavor what the nature of war is. War is human beings using all the cleverness God gave them and perverting it to the task of killing other human beings—planning, training, designing, building, all for the purpose of doing horrific harm. War is fundamentally destructive and a violation of how God intended humans to act. Is there glory in war? YES. The medics landing under fire. The finance officer climbing rubble with an M16. People risking their lives to protect others. Yes, that is glorious. But it’s a flavor of glory so bitter that it does not justify war. War can contain glory, but the horror is too great to fight just for the sake of the glory, no matter what fictional Klingons and the warrior cultures they were based on thought. War is NOT fundamentally glorious, even though it contains these horrible moments of greatness. It may sound strange to some of my readers, but I felt especially sick about an aspect of what I heard that I did not have any connection to at all, the Afghan soldiers who got blown up. Because it occurred to my imagination that the ones who got killed were the ones in front, the first ones to reach the suicide bomber. Which would be the ones who were in the best shape as they ran up the stairs—the ones who were trying the hardest, the ones who cared the most. And that is part of the perverse nature of warfare—it often kills those who are trying the hardest, those who are among the best of people. You have to pass a physical to be ALLOWED to fight in a modern military. While courts-martial records clearly show some bad people are in the services, that’s the exception, not the rule. In general, modern military training encourages positive virtues and tends to weed out the worst of the worst. The best of people go forth and run the risk of death or of being horribly mangled, while the slugs of society stay at home and collect the benefits paid for in somebody else’s blood. That’s an awful introversion of justice, how things should never be, but actually are. Which is a reason to hate war. But what shall we do when the bomb goes off and the tower collapses into rubble next to us? Shall we find a hole to hide in because we’re afraid? Or shall we refuse to fight, because war is a horror and we believe we cannot participate in it? Or shall we climb the rubble with Captain Brasheer and do what we can, because there is nothing else we can do, because if we don’t protect these people, who will? While I deeply respect people who acknowledge the reality of evil in the world but believe it’s wrong for them to add to the evil by fighting in a physical war, I have chosen a different path. I became a Soldier a long time ago. I am one willing to climb the rubble. So I love the…what’s the right term? I love the respect for service. The camaraderie to a degree. I also make use of the understanding I have gained of war to answer military questions on Quora and elsewhere, and I like being afforded some respect for what I know. I also love some of the struggles of war as narrative, some of tragic realities war causes, with profound respect for the tough choices people have to face. Warfare can make very compelling stories. But I also hate those things—my own tough choices, for example, cost me the relationship I had with my family. An effect I continue to suffer, though things are better in a number of ways than they were. I believe, though I cannot be sure without having done it, that I much rather would have lost a leg than my family. By the way, I loved Dunkirk because the movie captured the sense that the historical event of the evacuation of Dunkirk was about survival, both of those who were only trying to survive, and of those who either threw away their own survival or put it at great risk for the benefit of others. I find these war stories more moving than I used to, because I feel I really know what it’s like to face war, to lose friends, to be a risk, to risk for others. These are great stories. But I balk at tales that portray violence as too easy, as nothing but glory, as a walk in the park. It’s part of the reason why superhero movies usually but not always ring hollow with me. The typical superhero story fails in so many ways to show the world what it’s really like to face a situation so horrible that the only option you can bear is itself awful—and I would say that’s what it means to fight and kill to save others. Though war stories are also horribly wrong at times. On occasion, too optimistic. Though often enough in recent years bloody without a real sense of tragedy, bloody as if war is actually normal somehow and we should not be horrified by its effects. I personally am proud of my service but don’t wish to be defined by that alone. Have suffered, but don’t wish to be seen as a victim. Have served, but don’t deserve the presumption that I’m a hero. In short, I both hate and love war. I’ve tasted its fundamental nature and know the human race would be better off if we put aside warfare forever. Yet…some of the greatest stories are war stories, tragic because of the meatgrinder human evil puts people through, yet shining with patches of genuine glory. From a small Montana town where for a time I rode a horse to school, as an adult moved to Texas, I'm an Army Reserve officer who has served in Iraq and Afghanistan. I have a deep interest in history, science, and worlds of imagination and at the same time am a committed Evangelical Christian. I speak multiple foreign languages, and am working to become a commercially successful writer of science fiction and fantasy.